Habits and customs, prose and poetry, folk art and architecture, dances and songs are all a reflection of the soul of a stock of people whose roots reach deep into the past. 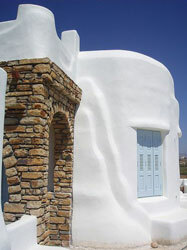 There is a wide choice of architectural sights in most of the settlements, testifying to the island’s rich history. In Naxos there are about 500 churches, 50 of these date to the Byzantine era, about 40 castles from the ancient, Byzantine or Venetian as well as 80 towers, 130 water mills and windmills most which are now derelict. These civilizations (of ancient Greece, Byzantium, and Venice) imprinted their mark heavily on the island’s architectural identity. What’s linking all these periods is the use of abundant Naxian marble. However, the effects of the Venetian rule are the most visible on the island’s architecture today. 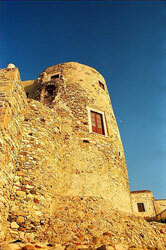 The medieval castle in Hora, the seat of the dukedom of the Aegean, is unique in terms of its design. The arresting stone towers which are spread out all over the island, are rare monuments and witnesses of the feudal establishment. The castle area in Hora is essentially a medieval town, preserved in the heart of the Aegean; it maintains more or less its original form. Inhabited continuously from 1207 until today, it contains a wall and the residential area which developed side by side; in a way, it is reminiscent of the rocky villages built on the Italian Riviera. The outer walls of the houses on the edge of the city compose the wall, which had only three gates. At one of these entrances, on the north-westerly side, the original wooden door is still in its place (the gate called Trani). 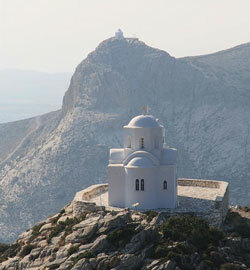 Above this, the main entrance to the castle, is the Krispi tower (or, as it is known today, the Tower of Glezos). This is the only one still standing out of a total of 12 - of the original defensive towers which were built all along the wall. Around the Duke’s palatial tower, the Venetians built their mansions, on some of which one may still observe their coats of arms. Outside the castle area there developed two other settlements. Bourgo, on the western side of the hill near the sea, with its Orthodox Cathedral, where some of the wealthier citizens, members of the Orthodox Church lived. On the southern side of the castle lies the settlement of Nio Horio (New Village), originally inhabited by Cretans. There was also a Jewish quarter, near Foudana (on the northern side of the hill) inhabited for a period of time by Jewish traders and a few Armenians. The same basic principles determined the way the houses of the ordinary people were built, whether these were in Hora or in the villages. The need for some kind of defense against enemy attacks, a prudent use of the limited available space, the durability of the building and the use of local building materials. In the traditional settlements the houses are adjoined to each other, with small courtyards. These houses were often extended over the next door house or over the street, creating the stegasta (sheltered streets), a distinctive feature of the streets of Naxos (the floor of the room on the first floor also serves as the ceiling for the archway). The streets, paved with slabs of stone, are very narrow: they are usually less than 2m in width.